White undercounter refrigerator, with three easy-to-wipe removable glass shelves. Defrosts itself automatically, saving you the chore of doing it yourself - and it's energy efficient too. Pairs with the ZFT11105WA. The refrigerator defrosts itself automatically, saving you the chore of doing it yourself - and it's energy efficient too. 7kg LINDO100 white condenser tumble dryer, with sensor drying, 4 point door reversibility, Gentle Care drum, XXL door and porthole, delay start timer up to 9hr, 8 drying programmes for cotton and synthetic, timed drying option. Special programs include: Easy iron plus, Wool and Duvet. B energy rating. 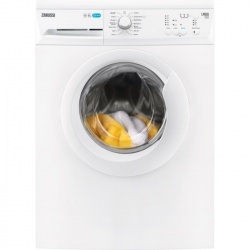 8kg LINDO100 1400rpm white washing machine, with AutoAdjust logic, Flexidose detergent delivery, AquaFall wash technology, a self-cleaning detergent drawer, universal motor, Time Saver function, internal filter, fourteen programmes, delicates programme, twenty minute quick wash, and delay start up to 9hr. A+++ Energy. There's no need to wait for freshly cleaned dishes to dry with the convenient ExtraDry function. This feature is perfect for when you need your dishes washed and dried in time for dinner. Keep your finest glassware sparkling clean without worrying about damage. The Glass 40°C protective clean program delivers a gentle wash to uplift stains and marks whilst taking care of delicate items. The Bosch SMS25AB00G Full-size Dishwasher was designed with flexibility in mind. Featuring a height adjustable upper basket, you can easily load all your kitchenware into the cavity, which can hold an impressive 12 place settings. ActiveWater technology: less water, less energy, more performance. This innovative rinsing technology maximises efficiency and ensures environmentally friendly rinsing for excellent cleaning results. The water and energy is saved through targeted water distribution, optimised filter technology, faster heating and higher pump performance for increased water circulation. AquaSensor: stain detection for brilliantly clean dishes. The AquaSensor regulates the water usage depending on the type and degree of soiling, using light beams to manage the rinse. Depending on remaining food particles, grease or detergent residues in the rinse, the rinsing process is assessed to evaluate whether it needs to be continued. The load weight is detected by a rotary speed sensor which recognizes the water level. For bigger loads, more water is needed to soak the dishes and the water level decreases. In that case more water is added. For smaller loads, less water is needed for rinsing. The load sensor provides for optimal water usage even for half loads or partial loads, saving water and electricity. EcoSilence DriveTM: powerful, durable, quiet and efficient. To increase our cleaning efficiency we have developed the economical EcoSilence DriveTM. It is exceptionally quiet, efficient and guarantees low electricity consumption. The EcoSilence DriveTM works without brushes is ultra silent and top results are automatically guaranteed. Glass protection technology for extra gentle handling for your delicate glasses. Because soft water causes glass corrosion, Bosch dishwashers with glass protection technology constantly regulate the degree of hardness. This is how we ensure that valuable glasses and delicate china are always washed with special care. Glass 40° programme: the extra gentle rinse programme for best cleaning, optimum drying and brilliant shine. The new glass 40° programme gently cleans glasses such as high-quality crystal glasses, while providing optimum drying and achieving a brilliant shine. This is made possible through lower temperatures, an adjustment in the rinsing agent temperature and an extension of the drying period. Shiny glasses and residue-free drying are clear proof of a brilliant and gentle cleaning result. Child lock on door prevents unintended door opening during rinsing. A child-proof door lock prevents the door from being opened and the programme being altered during the cycle. This prevents injuries caused by hot steam and accidental adjustments to the programme settings. With the time delay function you can pre-select the programme for the desired start time. This allows you to handle your appliance conveniently, at any time during the day, during work hours or at night. After the start of the programme a display indicates the precise remaining time. Vario basket is easily placeable in the lower basket. The Vario basket can be easily placed in the lower basket and provides additional storage space for cutlery. It is included as a standard in all ActiveWater models without VarioDrawer. Heat Exchanger: always the right temperature for optimal dish care. Dishwashers with heat exchangers treat precious glasses and porcelain with particular care and no risks. Water is pre-heated in the rinsing tank to avoid any temperature shocks. In a stylish white finish and with a width of 50cm, the Beko KDVC563AK electric cooker is sure to be a space saving and stylish addition to your kitchen. 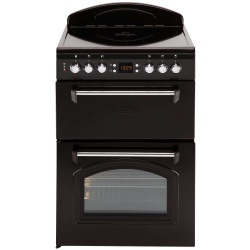 It features a large 57 litre capacity oven and an additional 28 litre separate grill. With thermostatic control, the Beko KDVC563AK can comprehensively handle a variety of dishes with their different cooking requirements, ensuring that all of your gastronomic delights will come out perfectly every time. The two oven cavities are topped off with a neat ceramic hob with 4 Rapidlite zones, while enamel liners in the oven cavities make cleaning easy and stress-free. 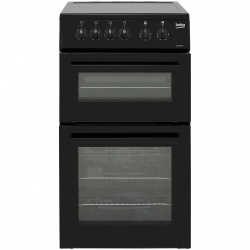 Removable, easy clean full glass inner doors and a full metal front panel with easy grip controls tops off this cooker. For more controlled cooling and freezing, our NeoFrost™ technology offers two separate cooling systems to maintain optimal humidity and freshness, faster cooling, and a dry environment in the freezer so ice won't build up. And, two separate cooling systems means odours won't transfer between the fridge and freezer, keeping your food tasting fresh and smelling fresh too. You won't need to worry about the internal temperature getting too high thanks to our air flow cooling system. Multiple air vents in the fridge and freezer maintain an even temperature on every shelf level and rapidly restore the temperature after you've opened the door. Find exactly what you're looking for quickly and easily thanks to our side LED lighting which illuminates each individual shelf as well as offers brighter, more durable and energy efficient lighting than standard lighting. Defrosting the ice build-up in your freezer is a time-consuming and frustrating job, but it can be avoided with Frost Free technology which automatically defrosts the freezer so you don't have to. The warm air which enters your freezer each time you open the door gets removed thanks to an automatic fan, leaving no chance for ice to build up. In case you've forgotten to shut your appliance's door, an alarm will sound to let you know that the door has been opened too long. Perfect for when you're on holiday or away from home for a longer period of time, the holiday mode will keep your appliance running in the most energy efficient way, saving you money on your energy bills. 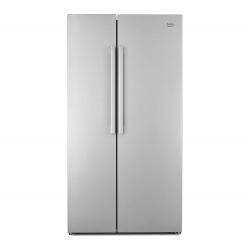 Create a more sleek and finished look in your kitchen with the concealed top door hinges on this appliance. 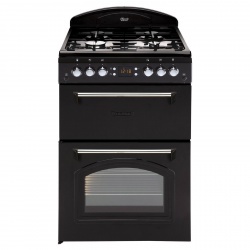 This cooker is perfect if you like the style of traditional range cookers, but don’t have the room. Two ovens for maximum capacity and greater flexibility. Main fan oven allows for faster cooking, saving time and producing great results. Cook clean liners are specially coated panels installed on the side walls of the main oven or ovens. When cooking at high temperatures; fat spits, dirt and grime are burnt off - removing the need to scrub and helping to keep your oven clean. The circular element combined with fan motor and specially designed cavities ensure that the oven temperatures are even throughout, delivering excellent cooking results. With continuous air movement, fan cooking helps to speed up cooking times compared to conventional ovens. With two separate ovens your cooker gives you more flexibility and capacity. It provides you with more oven space which you need when the family visits, but also allows you to cook dishes at different temperatures to the rest of the meal with no hassle. Programmable Oven - The programmable timer can turn the main oven on and off at pre-selected times. Whether you want to programme the oven to turn on before you get home, or turn off after the meal has cooked, the easy to use timer ensures greater control. Cook Clean Liners - Cook clean liners are specially coated panels installed on the side walls of the main oven. When cooking at high temperatures fat spits, dirt and grime are burnt off - removing the need to scrub the oven walls to keep them clean. 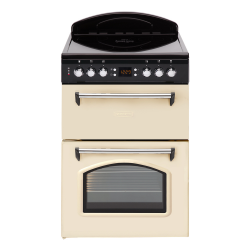 Triple Oven - The Range 90 has three ovens for complete cooking versatility. A multifunction main oven and tall fan oven ensure plenty of cooking space and the third oven and grill in the top cavity provides even more flexibility for those big family meals. Having multiple ovens also enables you to cook foods at different temperatures and avoid contamination of flavours between dishes. True Fan Cooking - Fan cooking is ideal for fast and even cooking results. The circular element combined with fan motor and specially designed cavity ensures that the oven temperatures are even throughout, and things heat up quickly. It will allow you to cook most things at a lower temperature and in a shorter time.